One of the essential tools in a home mechanic’s arsenal is a quality floor jack. Floor jacks are a happy middle-ground between scissor jacks and lifts. They give you enough space to work but don’t require massive garage setups. Ahead, we’ll take a look at some of the best floor jack options on the market so you can find the best one for your garage. Benefits of Hydraulic Floor Jacks. What to Look for in a Floor Jack. 4. Arcan XL20 Black Service Jack. 5. Blackhawk B6350 Fast Lift Service Jack. 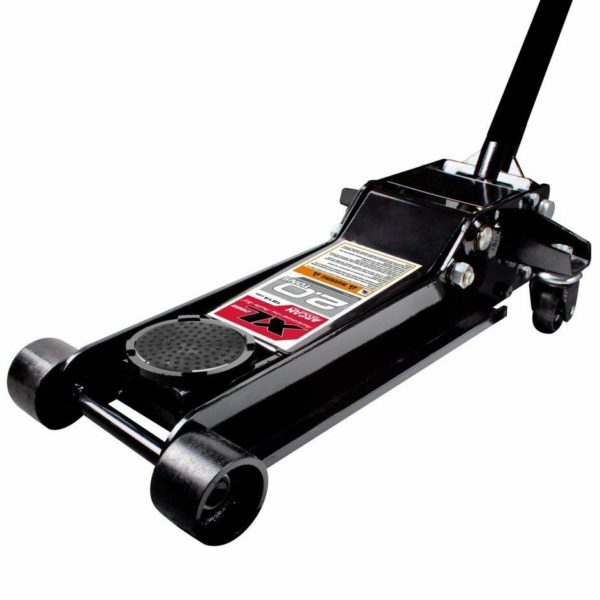 Hydraulic floor jacks are probably the most common form of floor jack you’ll see when you’re looking for a jack to use in your garage. You can tell a hydraulic jack by the way it looks. It has four wheels and a lever. You will slide the jack under your car and crank the lever until it raises it to your desired height. This type of floor jack is one of the most versatile. You can usually lift a car or truck quite high into the air without worrying about too much leaning. You sacrifice a bit of mobility when using a hydraulic floor jack, but there are several benefits to using such a jack. Ahead, we’ll take a look at why home mechanics should consider a hydraulic floor jack over the alternative. Safety is essential when you’re using a jack, especially if you’re going to be working under the vehicle. A lot can go wrong, but hydraulic floor jacks are often the safest way to lift and work on your car. You have to use the floor jack responsibly. You can’t rely on the jack alone to hold your car for long periods, and you need to follow the capacity limit of the jack. If you do everything right, though, floor jacks remain the safest way to lift a car. Floor jacks are extremely easy to use. You could lift a vehicle with a floor jack with hardly any prior experience. They’re simple, straightforward, and don’t have a lot of room for error. You will have to know where the lifting points are on your car, but that’s pretty much it. You can find these points easily – manufacturers make it clear where they are. The handles are usually padded, and the lift has a very small chance of damaging your car. Once you get everything in order, you start cranking the lever and lift your car. Versatility is another reason a lot of people prefer floor jacks over lifts and scissor jacks. Most people will be able to use a floor jack for all of their auto mechanic needs. Lifts allow you to raise vehicles high off of the ground, and scissor jacks only give you a few inches under the tire. Floor jacks make it easy to change a tire or lift your car into the air and hold it there. You can place additional parts under the car to hold it up and work on the undercarriage. Most floor jacks will work on low-profile cars as well. Cars with higher clearance might stretch the limitations of a floor jack, but you can sometimes find a floor jack that will lift high profile trucks as well. Floor jacks can do it all – or just about – which is why a lot of home mechanics choose them over the alternative. There are a few things to look for when shopping for a floor jack. In this section, we’ll give you a brief buyer’s guide to walk you through a few characteristics to look for and personal preferences to consider. The first priority is safety when you’re considering a floor jack. That means you jack has to be stable and secure at all times. You need a jack that is solidly built first before you consider what you’re looking for in a floor jack. The best floor jack options have built-in safety features that will prevent a floor jack from failing as well. Of course, the bulk of the safety responsibility relies on you, but it helps to have a floor jack that will pick up some slack on the safety end. The best floor jack for you will largely depend on what type of car you own. If you have a heavy, bulky car, you’re going to need a floor jack that can handle the load. Those who have smaller cars have more variety to choose from when shopping for a floor jack. Keep in mind that a floor jack is only going to hold up to around 70% of your car’s weight, so you don’t need to go overboard. We suggest getting a larger maximum capacity on your jack stands (more on this below). For most applications, a floor jack that can hold three tons will be enough. Those with larger cars may want to opt for a floor jack that can lift four tons. The profile of your car also plays a role in what floor jack you want to buy. Floor jacks are great for low-profile cars, but you may run into some trouble if you’re trying to lift a truck with high clearance. Floor jacks are excellent for lifting a car, but they aren’t designed to hold them there for long periods. You should never rely on a floor jack to hold your vehicle in place – especially if you’re working underneath the car. Some floor jacks come with jack stands, but you’ll likely have to purchase some of your own. These devices are much sturdier than a floor jack by itself and allow you to get under the vehicle and repair or replace whatever you need. To use a floor jack and jack stand, you need to lift your car, place the jack stands under it, then lower the car onto the jack stands. Jack stands, and floor jacks both have capacity limitations. If you’re buying them separately, it’s important that you don’t buy a floor lift that has a higher capacity than your jack stands do. Buying these tools this way is dangerous, and raises your risk of serious injury. Operating a floor jack can be dangerous if you don’t take proper precautions. We’ve already covered the importance of jack stands, which are essential when working under a vehicle. Floor jacks are for lifting purposes only. You should always know the lift points and jack points in your car before you start. Lifting your car in the wrong spot can not only damage your car, but it can be a massive safety hazard. Check the owner’s manual if you’re unsure where you jack points are. Always make sure you’re lifting your car on even ground. Even a slight slope can put you in serious danger. Hydraulic jacks are generally safe and durable, but everything will eventually fail – that’s why jack stands are so important. Using a hydraulic jack when it’s failing can be particularly dangerous because it will slowly start to lower the car. You could become trapped before you even know what’s wrong. Here is our list of the five best floor jack options on the market. Take a look at each and find the best one that fits your home garage needs. 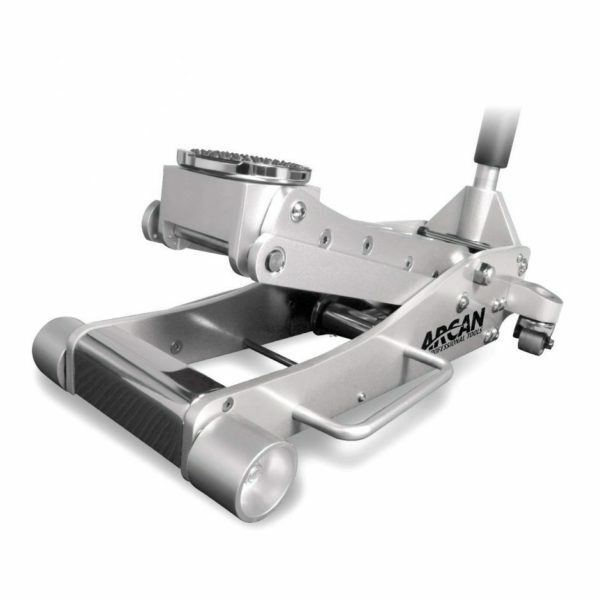 The Arcan ALJ3T, Aluminum Floor Jack is one of the better floor jacks on the market. 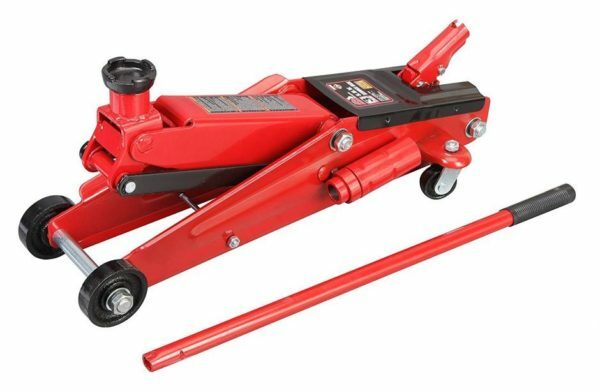 It’s a 3-ton, dual pump piston floor jack with a two-piece handle and reinforced lift arm. This floor jack is one of the sturdiest and most durable options on the market. It can lift up to three tons – which fits the needs of most home mechanics. The dual pump pistons make lifting easy, and the overload valves prevent the hydraulic arm from overloading and damaging the jack and your car. Although the jack is a bit on the heavier side, the swiveling wheels make it easy to maneuver in the garage. This is a feature that’s particularly important to someone like me, who has limited room to work in the garage. There are few negatives to mention with this floor jack. It’s not cheap, and it’s heavy, so you won’t be lugging this from garage to garage too often. Apart from that, though, this is one of the better floor jacks you can buy. 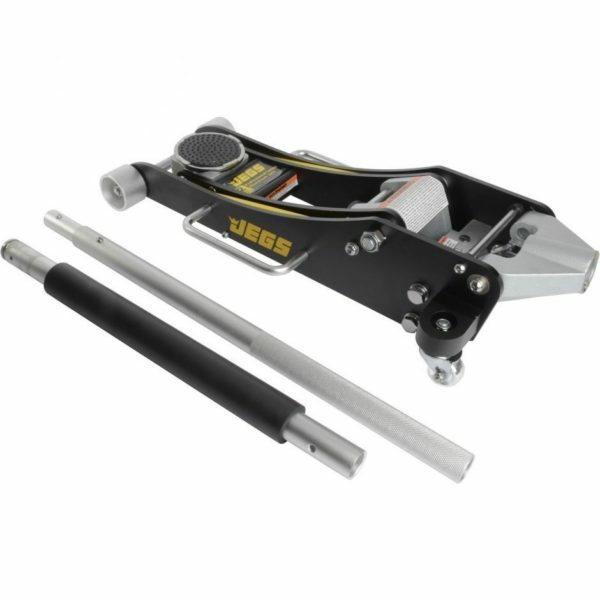 The JEGS 80006 floor jack is our top pick for low profile cars. It will only lift up to two tons at a time, but that’s fine for most people – especially those who are lifting a low-profile car. If you plan on using your floor jack for several different cars, though, you may want to take a look at one of the other options we’ve listed. This floor jack is excellent if you need something that’s a bit more portable than most. I, for instance, let my friend borrow my heavy floor jack for his car a few weeks ago. It’s huge, and I had to have him help me lift it and put it in the back of my car. The JEGS 80006 doesn’t have that problem, though. It’s relatively lightweight, and it’s compact when you break everything down. The handles on the side make it easy to carry – all things considered – and you can easily bring it to another garage without the help of another person or a back-support brace. The Torin Big Red Hydraulic Trolley Floor Jack is our pick for the best floor jack for the money. This one is a value option for floor jacks and will cost you less than $100 from most outlets. 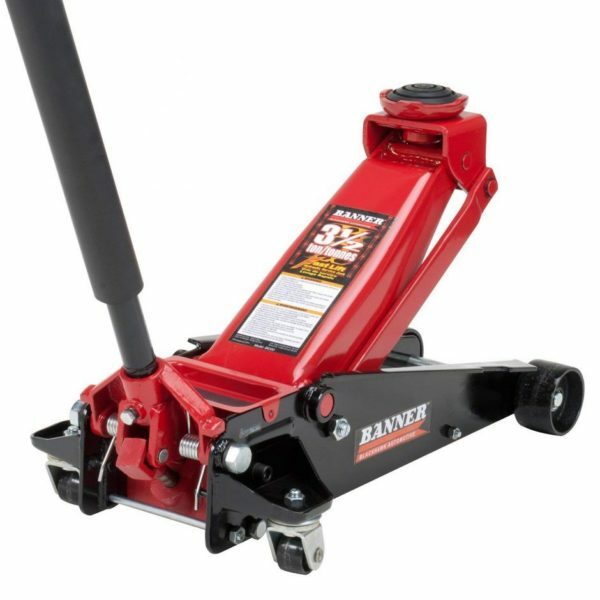 Those who need a floor jack for occasional use – changing a tire, routine brake jobs, etc. – will certainly get their money’s worth with the Torin Big Red Hydraulic Trolley Floor Jack. The negatives of the Torin Big Red Hydraulic Trolley Floor Jack are about what you expect. It’s cheap, so it’s not going to last as long as some of the other floor jacks we’ve included on our list. The wheels, in particular, seem to lack a bit of durability. 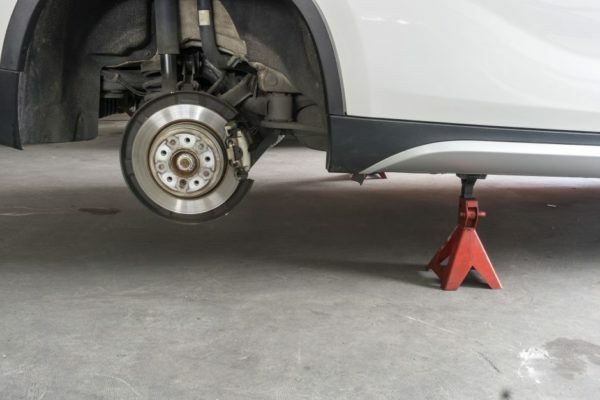 This can be troublesome when lifting particular cars, but you can mitigate the risk by spending more on quality jack stands. Still, we think this floor jack presents the best value on our list. It can lift up to three tons, and it can reach high enough to lift some higher-profile trucks and SUVs off the ground. The Arcan XL20 Black Service Jack is another floor jack that won’t break the bank. It’s a bit more expensive than the Big Red option we listed above, but it’s far more durable and comes with a few more options to choose from. I like the ability to choose between two or three-ton lifting capacity. I, for instance, would only need a two-ton floor jack, so I could save some money by purchasing that version of this jack. The compact design is another standout feature of the Arcan XL20 Black Service Jack. It fits in tight spaces, which makes for a more versatile jack. You don’t have to find a huge space in your garage to store it when you’re done. In short: this floor jack just works the way it should. It’s a standard floor jack that won’t be the best for high clearance trucks but will fit the needs of most home mechanics who work on sedans. The Blackhawk B6350 Fast Lift Service Jack is a fantastic option if you need a bit more out of your floor jack. Those who need a jack to lift a bit more weight a bit higher than other floor jacks will look to something like the Blackhawk B6350 Fast Lift Service Jack to best fit their requirements. This jack is easily maneuverable, well-constructed, and quick. You can lift your car or truck off of the ground with a few easy pumps, which is especially important when you’re lifting high clearance trucks or SUVs. While the Blackhawk B6350 is easy to move around your garage, you need to make sure it sits on a clean surface. The wheels get snagged on things like little pebbles, and the jack is pretty heavy when you’re trying to lift it over such obstructions. This jack might be a bit much for people who just want a floor jack for their sedan. Those who need a bit more lift and power from their floor jack, though, will be happy with the Blackhawk B6350. Out of all of the floor jacks we reviewed, the Arcan ALJ3T, Aluminum Floor Jack was the best of the bunch. There’s hardly anything bad to say about this jack other than the high price, but it’s certainly worth the value for those who can afford it. This jack is sturdy, well-constructed, and durable. It will last for years without any hint of failing and will serve the needs of almost any home mechanic. Of course, the best option for you may be different than our overall pick. Those who need more capacity or higher lifting will do well with the Blackhawk B6350. People who want a cheaper floor jack could choose the Big Red jack we included. Determine your needs before you buy, but our recommendation is the Arcan ALJ3T, Aluminum Floor Jack.